Noreum Machi, referring to a performer who is so skilled that no one would dare to follow on stage, specializes in the virtuosic Korean percussion music known as Samul-nori. 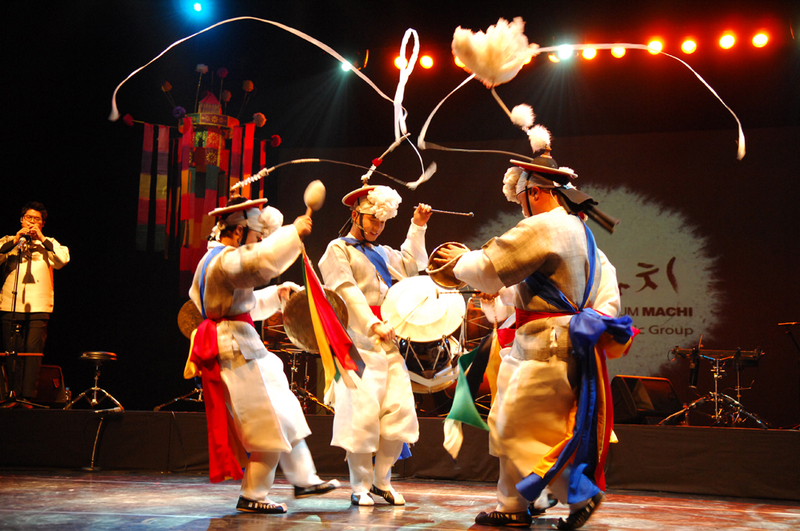 Coming from Korea, Noreum Machi’s colorful program includes spectacular percussion dialogues, haunting shamanic chants, and entrancing acrobatic dances. The group specializes in the virtuosic percussion music known as Samul-nori. Samul-nori is a modernized-staged adaptation of the ancient Pungmul-nori, famers’ ritual that had its origin in shamanism and animism. Samul-nori (Samul means “four objects” and Nori means “play”) is performed primarily with four traditional instruments; Jang-gu, Buk, Jing, and Kkwaenggwari. Other instruments used are the Taepyongso and Piri. Each of the four main instruments represents different elements of nature: the Jang-gu represents Rain; the Buk, Clouds; the Jing, Wind; and the Kkwaenggwari, Thunder Storm. Yin and Yang is also reflected: the Buk and the Jang-gu represent the sound of the earth, while the Jing and the Kkwaenggwari represent the sound of the heaven. Old Boy by Dooby's will be here this Saturday (before this event) to sell Korean food the way their mothers made it when they were kids. Come early, come hungry!